It’s hard to believe, but the materials for your dream space had a life long before you. And it is that history that makes them perfect for your home. Before they took residence in your home, they lived in nature. And, in many ways, nature lived in them. This is evident in the grain of the wood, the pinholes, the knots, the burls and the eclectic coloration left behind by mineral deposits. If you look closely, you can read the story of their former life. As with all organic material, there are also things to expect as the wood adjusts to a new life in your home. Discover the selection of wood types available from KraftMaid and find out for yourself how wood and finish combine. 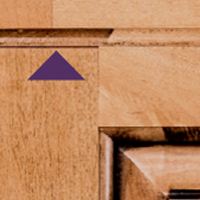 Show through or “telegraphing” of wood characteristics may happen when paint is applied to any specie of natural wood. These characteristics, such as open grain, pin holes, knots and mineral streaks, may be visible through the paint. Telegraphing may happen on doors, face frames, moldings and any decorative end panel or enhancement made of natural wood. Take this into consideration when choosing our finishes that feature paint as the base technique, including paint with glaze and vintage techniques. 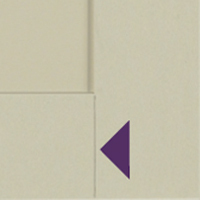 All KraftMaid finishes are hand-crafted. As such, each door will be consistently unique. In addition, the natural characteristics of wood lend themselves to color variation, and this is also true when finish is applied. 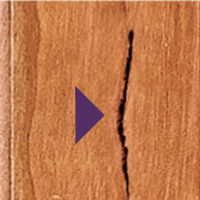 Veneer wood absorbs more stain than solid wood and will appear darker. 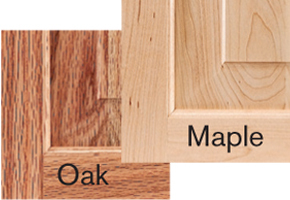 Some door styles are built with a solid wood frame and a veneer center panel, which will show more color variation than doors with all solid wood components.